With my oldest, who is now 9 and in 3rd grade, I started teaching reading and spelling together. I taught her rules and phonograms and we practiced and practiced. It wasn’t long before she took off with reading but her spelling was abysmal. I thought I had failed. Clearly there was something wrong with her or with me. Why did her reading ability take off while her spelling ability was non-existent? Her reading ability continues to steadily increase. But this year, her spelling ability has soared. It has taken us several years to make any real progress in spelling. Spelling has been the one subject we just could not conquer. I tried a little something different with Tiger when he was in Kindergarten last year. I started teaching him how to read. I never even talked about spelling. He did NOTHING for spelling. I didn’t require him to write a single word unless he wanted to. All we did in Kindergarten was read and read and read. And I read to Tiger every single day. With Tiger, he started spelling instruction one year after he began to learn to read. I only added in some slow and steady spelling instruction the following year, his 1st grade year. I teach spelling through rules and phonograms much as I teach reading so this teaching only reinforced what he had already learned for reading. He made slow and steady reading progress and this year is starting to read very well. He is also making very slow spelling progress but I can actually see the progress. I know that his spelling ability is above where his sister’s ability was at this age. So, what happened? Is it just a difference between my kids or is it something about how I teach? I’m sure there is research to back up my claim but I’ve discovered that my kids can’t process both learning to read and learning to spell at the same time. Their brains need to focus on reading first and then add in spelling instruction. For my kids, it is much harder to encode words (spell) then it is to decode words (read). Therefore, I’ve begun to teach reading first and focus on learning to read for at least an entire year before I introduce spelling. This way my kids can become familiar with letter and phonogram sounds and start to recognize them by sight. The following year we start learning to spell words which requires my kids to recall the various letters and phonogram teams, choose the correct one, and use it to build a word. It’s been easier for my kids (and for me as the teacher) to give them time to learn the phonograms very well before I expect them to recall them from memory in order to spell a word. I’ve seen that Tiger has had an easier time learning to spell than Curly did. I believe it’s because he had more time to solidify his foundation of learning the phonograms through reading instruction. So, my new method for teaching will always start with reading, teaching phonics and helping my kids sound out words. Only after we have begun to make real progress in reading will we introduce any spelling. I’m hoping this saves us lots of frustration in the future! And if you’d like more information about the reading and spelling curriculum that we use and love, click on the picture below! Interesting and this makes sense. 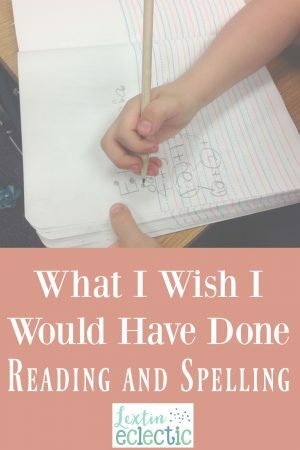 This year, we purposely pulled back on spelling with my struggling reader and concentrated on reading. This has certainly paid off in terms of reading although we will have to tackle spelling next! This is what has worked for us so far. I'm sure there is science to back me up but I don't have time to research it. But I am convinced that my kids' brains can only handle one major learning activity at a time. Teaching spelling and reading at the same time was a huge fail at our house. Now that I focus on reading first and then spelling, we're having more success.